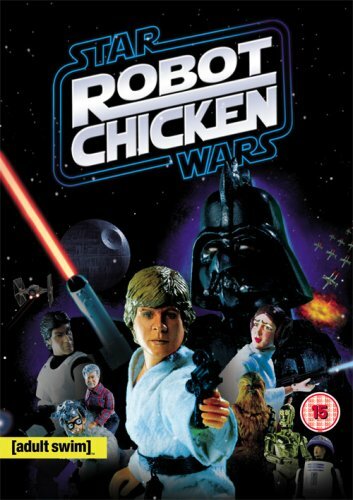 I have already seen the full season 4 of Robot Chicken (read review). I really enjoyed the crazyness of it and extreme sense of humour. It is cool how it is produced as well. There is now an [adult swim] take on the Star Wars Universe. The DVD is low-cost and available now at HMV. This is very much your typical Robot Chicken in the same style and sense of humour, produced in the same stop-motion animation way as well. It is directed by Seth Green so you know what to expect! One of my favourite scenes was the Emperor and Luke Skywalker having a Yo Mamma battle contest! Another favourite was the George Bush trying to make an advisor change what he was saying from ‘we still haven’t found any weapons of mass destruction’ to the opposite. In general there is lots of good George Bush bashing throughout, which doesn’t get old despite him leaving the white house a good while ago. But that’s enough with the spoilers! They give you a taste of what is the in episode. There are also some great extras on the DVD. In total the extras last a good 2 hours. Including 3 bonus episodes of [adult swim], one is Frisky Dingo and it was also good to enjoy a bit of Harvey Birdman again. You can also watch an animation meeting, see behind the scenes, view a photo gallery and watch some cool deleted scenes. Although the main episode is reasonably short you still get a lot to watch thanks to the extras. So for the sake of a few quid (which is literally all it costs by the way) you get some funny stuff to watch, definitely good value for money. If you like Star Wars, or are into this style of comedy, it is another one of [adult swim] well worth checking out.